Quinoa is so nutritious that the Food and Agricultural Organization of the United Nations named it grain of the year for 2013. Compared to other grains, such as wheat or rice, quinoa is a better source of protein, as well as a number of vitamins and minerals. And like other grains such as rice, quinoa is available in different colors, including red and white. Although they are the same grain, there are slight nutritional differences between red and white quinoa. There is very little difference in calories between the red and white quinoa if you're using a calorie counter. A 1/4-cup serving of uncooked red quinoa contains 170 calories, while the same serving of white quinoa contains 172 calories. A 1/4-cup serving of red quinoa contains 32 grams of carbs and 5 grams of fiber, while the same serving of white quinoa contains 31 grams of carbs and 3 grams of fiber. If you're trying to raise your intake of fiber, red quinoa makes a better choice. Most Americans don't meet the recommended 25 grams to 38 grams of fiber per day, according to the Dietary Guidelines for Americans 2010. Increasing your fiber intake improves hunger control and heart health and reduces the risk of Type 2 diabetes. Red and white quinoa have the same amount of protein per serving, but have slight differences in fat content. A 1/4-cup serving of either colored grain contains 6 grams of protein, while the same serving of red quinoa contains 2 grams of fat and the white 3 grams. Unlike other grains, quinoa contains high amounts of the essential amino acid lysine, which makes it a high-quality source of protein. When it comes to vitamins and minerals, the white quinoa makes a better choice. 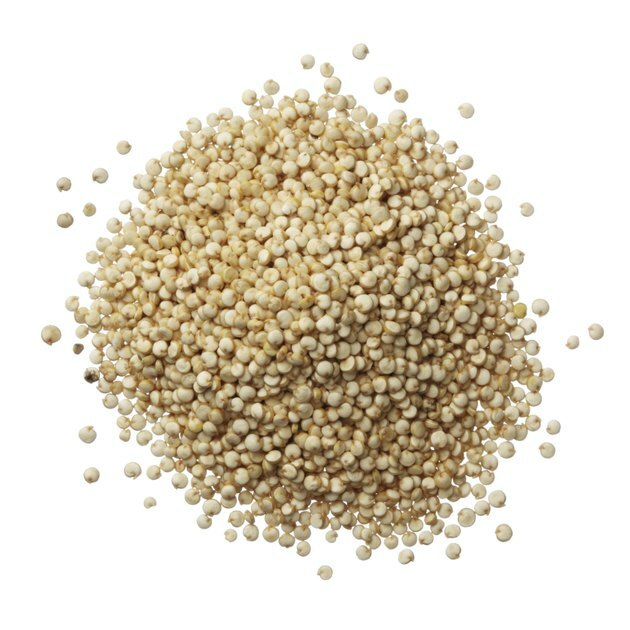 A 1/4-cup serving of uncooked white quinoa meets 12 percent of the daily value for iron, 50 percent of the daily value for riboflavin and 23 percent of the daily value for phosphorus. The same serving of red quinoa meets 10 percent of the daily value for iron and phosphorus and 15 percent of the daily value for riboflavin. Both iron and riboflavin help support healthy red blood cells, and phosphorus is needed for healthy teeth and bones.